With so many different types of yachts to choose from, it can be hard to know your Flybridges from your Tri-Decks if you’re just starting your search. Although there is a growing number of terms used to describe the different types of yachts out there, many of the terms overlap or are used interchangeably. If you’re on the market for a yacht, the team here at Van Isle Marina has compiled a review of the different terms you’ll likely come across when cruising through yachts for sale. Below is our brief guide to understanding the different terms the boating community has been known to use to describe yachts. What exactly makes a yacht a yacht, and not just a big boat? There is no nailed down definition of what makes a yacht a yacht, but most boaters consider a yacht to be any type of sea vessel that is used strictly for recreational or pleasure purposes like cruising, entertaining, water sports, fishing, or year-round accommodations. 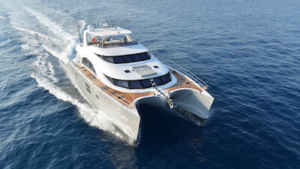 Yachts are usually large enough to have some form of sleeping quarters (cabin) on board for overnight trips as well as a kitchen (galley) and a bathroom (head). They are also large enough that they require more than human inputs (i.e rowing) to propel forward. Yachts are classed by many things, including their mode of propulsion, size, style, amenities, and function. A yacht is first defined either as a sailing yacht, motor yacht, or gulet yacht, and then as a sports or luxury yacht. Luxury Yacht: a yacht that includes high-end finishes and features and the latest in modern performance technology. The term ‘luxury’ can precede any type of yacht, i.e. “luxury motor yacht”, “luxury sailing yacht”, etc. Sports Yacht: a yacht geared towards fishing, water sports, or cruising with a sleeker design and more powerful motor for faster cruising speeds. The term ‘sports’ can precede other types of yachts as well, i.e. “sports motor yacht”. Catamaran Yacht: a yacht with two hulls (pontoons) often made of fiberglass that can be used in shallow waters. Yachts can further be defined as a superyacht or megayacht, depending on their size. Superyachts are typically 24 meters (78 feet) and above. Megayachts are typically over 80 meters (260 feet). Most motor yachts on the market are typically 24 meters (78 feet) or less. There are only a handful of megayachts in the world due to their extravagant price tag. 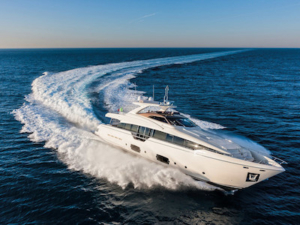 Yachts can further be grouped or defined according to their form and function, such as with flybridge, sedan, pilot house, and sportfish yachts, for example. Classic Motor Yacht: a yacht that was built between the 1920s and 1970s (before today’s modern technology began dominating modern yacht manufacturing). A modern yacht can be built based on the classic motor yacht style. Sedan: a popular yacht style with deck space above the hull and living quarters below. The living quarters of a sedan yacht are enclosed and single-level. Flybridge: a sedan-style yacht with an open deck and more comfortable living space above the main bridge of a vessel. Daybridge: a multi-level yacht that is even more open than a flybridge. Belize Motoryachts are known for creating this distinctive style of yacht. Open or Enclosed: a term used to describe the layout of and access to the flybridge. In an enclosed flybridge, access to the above flybridge is enclosed inside the living space. In an open flybridge, access to the flybridge above is open to the elements. Downeast Style: a low-profile yacht with a large working cockpit and small helm station. This highly recognizable style is inspired by the mid-1900s traditional Maine lobster boat. Back Cove yachts are a shining example of downeast-style inspired yachts. Pilothouse: A multi-deck yacht like a flybridge with a larger interior main deck. See the Offshore 62 Pilot House as an example. Sky Lounge: an enclosed area at the top of the vessel that provides the benefits of the view but with several amenities, protection from the elements, expansive windows and sometimes a sunroof. Cockpit Motor Yacht: a yacht with more cockpit space than deck space. Sportfish or Sport Fishing Yacht: A yacht used for fishing with a large cockpit, storage space, and the ability to handle rougher seas. These can also be referred to as Flybridge Sportfish or Sportfish Express and are built for longer durations out on the water. Convertible: a yacht that combines features of a standard motor yacht with a sportfish yacht to have entertaining space when you need it, and also fishing space when you need it. SUV: a yacht that combines features of a standard motor yacht and sport yacht. See the Riviera 575 SUV to learn more about this emerging style of yacht. Tri-Decks: a superyacht with three levels of staggered, enclosed living space. Expedition Yachts: a large yacht with a deeper displacement hull for more stability and comfort during longer-range trips. Read a few descriptions of yachts for sale and you’ll soon realize the boating community sometimes seems to have its own language. 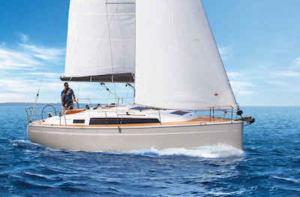 To accompany this roundup of yacht types, check out our Parts of a Boat post for more information, or jump right into checking out some of the models we at Van Isle Marina have for sale right now. https://vanislemarina.com/wp-content/uploads/2019/03/boat-types-when-is-a-yacht-a-yacht.png 788 940 Van Isle Marina https://vanislemarina.com/wp-content/uploads/2018/02/logo-web.png Van Isle Marina2019-03-18 12:42:102019-03-19 09:44:07When is a Boat a Yacht?